Chemical Abstracts Service a division of the American Chemical Society is the world's authority for chemical information. CAS is the only organization in the world whose objective is to find, collect and organize all publicly disclosed chemical substance information. CAS delivers the most current, complete and secure and interlinked digital information environment for scientific discovery. The Directory of Research Journal Indexing (DRJI) is to increase the visibility and ease of use of open access scientific and scholarly journals thereby promoting their increased usage and impact. Google Scholar: Google Scholar is a freely accessible web search engine that indexes the full text of scholarly literature across an array of publishing formats and disciplines. 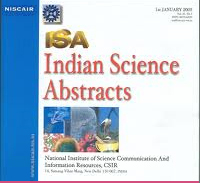 Indian Science Abstract: Indian Science Abstracts (ISA) is a semi-monthly abstracting journal which has been reporting scientific work done in India since 1965. Original research articles short communications, review articles, and informative articles published in current scientific and technical periodicals, proceedings of conferences and symposia, monographs and other publications, as well as patents, standards and theses are reported in ISA. Index Copernicus: Index Copernicus International is an international, specialist platform for promoting the achievements of science, and the support of national and international collaboration between scientists, publishers of scientific journals and scientific. J-Gate: The largest e-Journal portal for 28,000+ academic, research and industry journals, indexing more than 3.0 million articles a year with dynamic links to full-text. JournalTOCs JournalTOCs is a Current Awareness Service (CAS) where you can discover the newest papers coming directly from the publishers as soon as they have been published online. 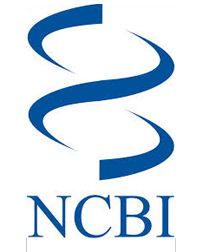 National Center for Biotechnology Information (NCBI): The NCBI houses a series of databases relevant to biotechnology and biomedicine. Major databases include GenBank for DNA sequences and PubMed, a bibliographic database for the biomedical literature. Other databases include the NCBI Epigenomics database. All these databases are available online through theEntrez search engine. NISCAIR: NISCAIR will be to collect/store, publish and disseminate S&T information through a mix of traditional and modern means, which will benefit different segments of society. CNKI ( China National Knowledge Infrastructure ) e-publishing project is to achieve full social knowledge sharing and dissemination of value-added utilization of resources targeted at information technology projects.It began in 1996 and publishes databases containing e-journals, newspapers, dissertations, proceedings, yearbooks, reference works, etc. Citefactor is a service that provides access to quality controlled Journals. The Directory indexing of journal aims to be comprehensive and cover all scientific and scholarly journals that use an appropriate quality control system, and it will not be limited to particular languages or subject areas.